Use of the Atlas data is subject to the Open Government Licence - Canada. 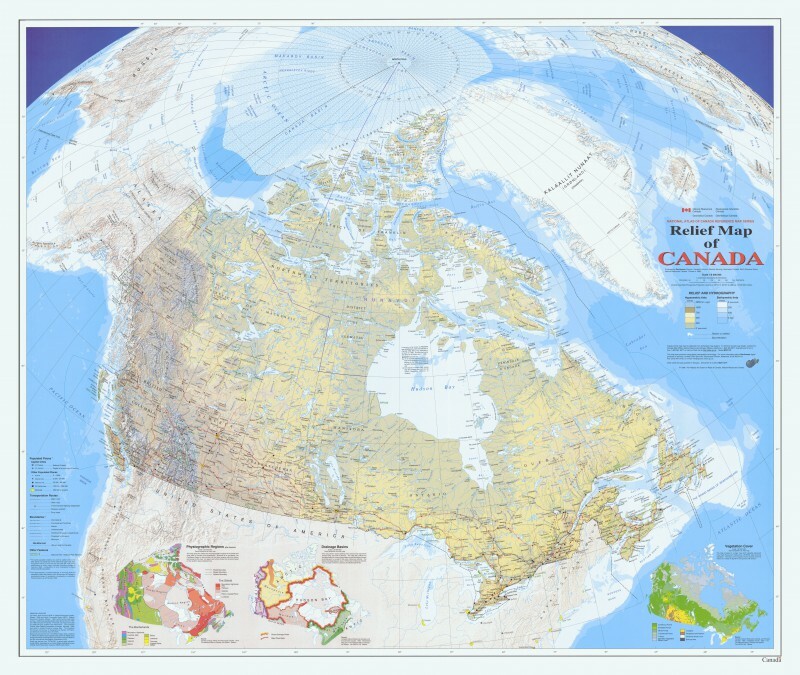 It is an update to the 1:6 000 000 paper map of Canada published in 2006. 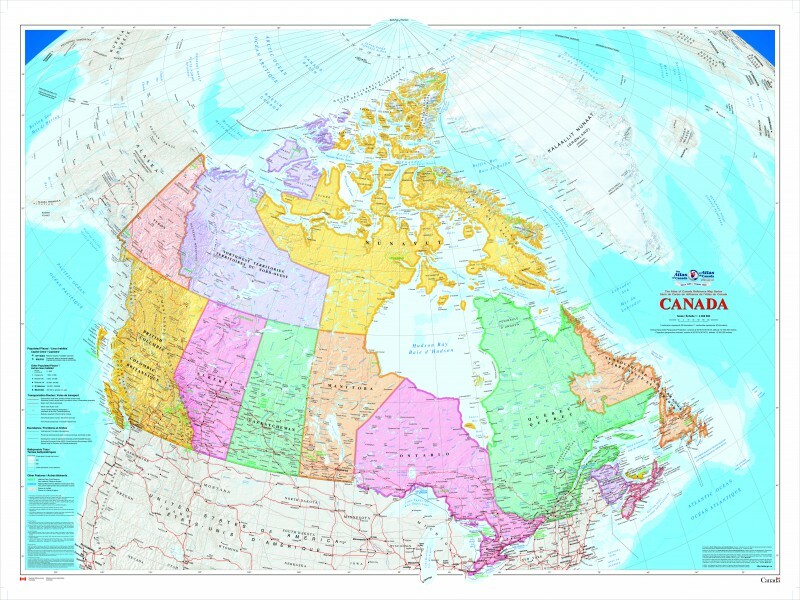 The map uses a vertical near-side perspective projection, which provides a unique three-dimensional view of Canada. Most data are current to the period 2010 to 2013. View more details on Canada (2014) – Open Government. 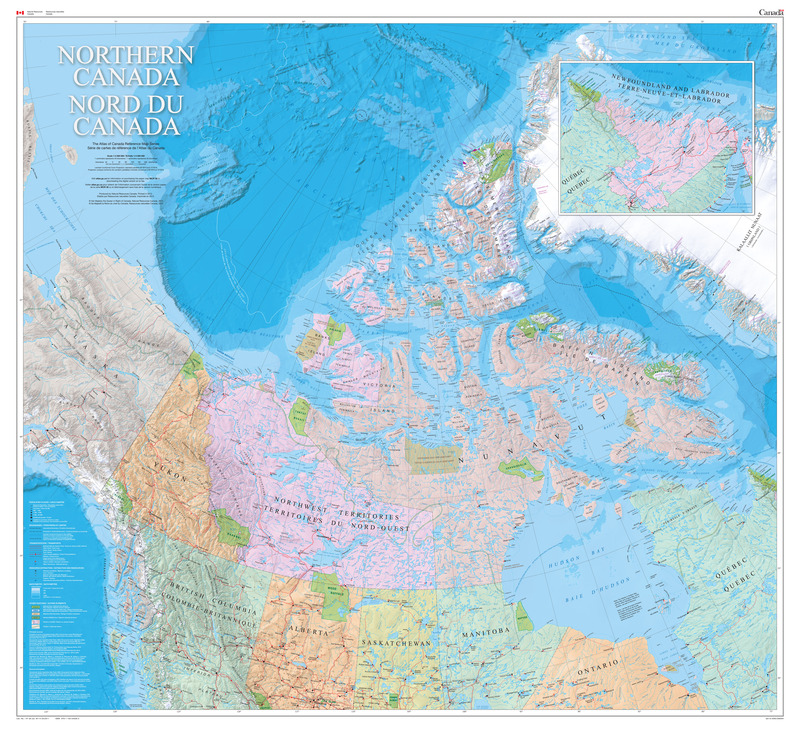 The vast Canadian geography north of approximately 50° latitude is depicted on the map Northern Canada / Nord du Canada. The 1:4 000 000 scale provides a detailed regional base of the north. The map shows the three territories, the northern areas of the provinces, and adjacent areas of Russia, Alaska, and Greenland. The surveyed locations of the Magnetic North Pole are mapped from 1831 to 2011. An inset of the Labrador coast shows the cultural connection of Nunatsiavut to the Inuit of Nunavut. View more details on Northern Canada (2012) - Open Government. 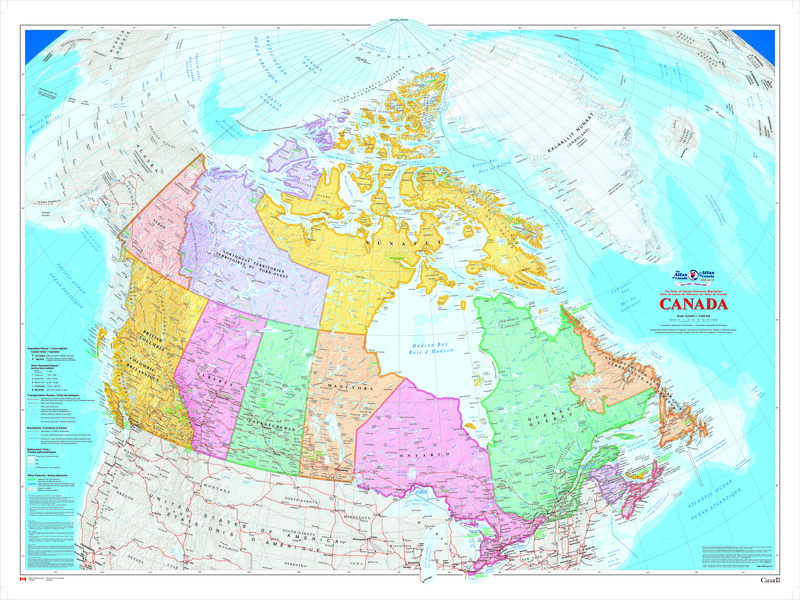 This colourful edition of the Canada map published in 2009 is the largest of the Atlas of Canada wall maps. Relief shading highlights the physiography of the country and the map's projection provides a three-dimensional view of Canada. View more details on Canada (2009) - Largest wall map - Open Government. This map uses the Vertical Near-Side Perspective Projection. The map's main feature is showing Canada with very-detailed digital shaded relief. All official Canadian, provincial, and surrounding international boundaries are shown, including the proposed boundary for the new territory of Nunavut (which came into existence in 1999). There are three small maps of Canada shown on this map sheet, all at scale 1:35 000 000. One shows the major physiographic regions; the second shows major drainage basins, and the third map shows classes of vegetation cover. All data on the map is current to the mid to late 1990's. View more details on Relief Map of Canada - Open Government. This map shows the World at an equatorial scale of 1: 35 000 000. 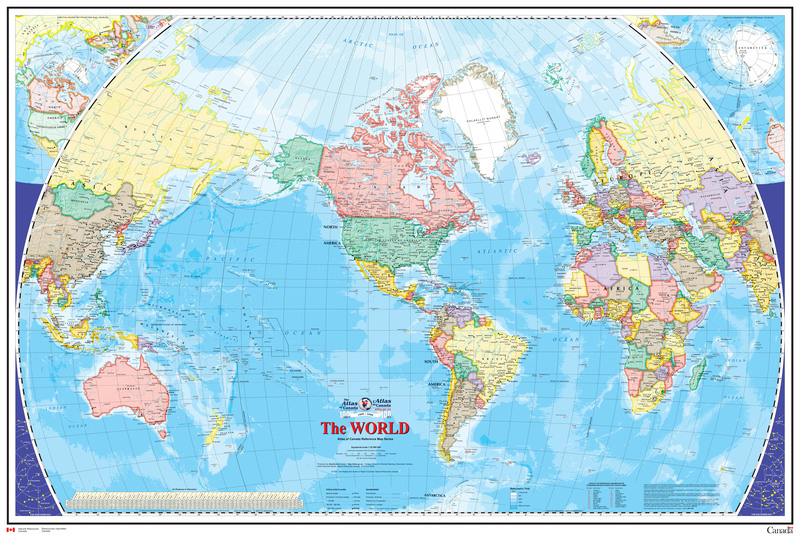 The map is a general reference sheet focusing on showing the name and status of all sovereign countries and dependencies, and showing major cities. The 2005 version has two new additions: one is showing shaded relief for land areas, the other is showing bathymetric contours and colours for all marine areas. View more details on The World (2005) - Open Government. 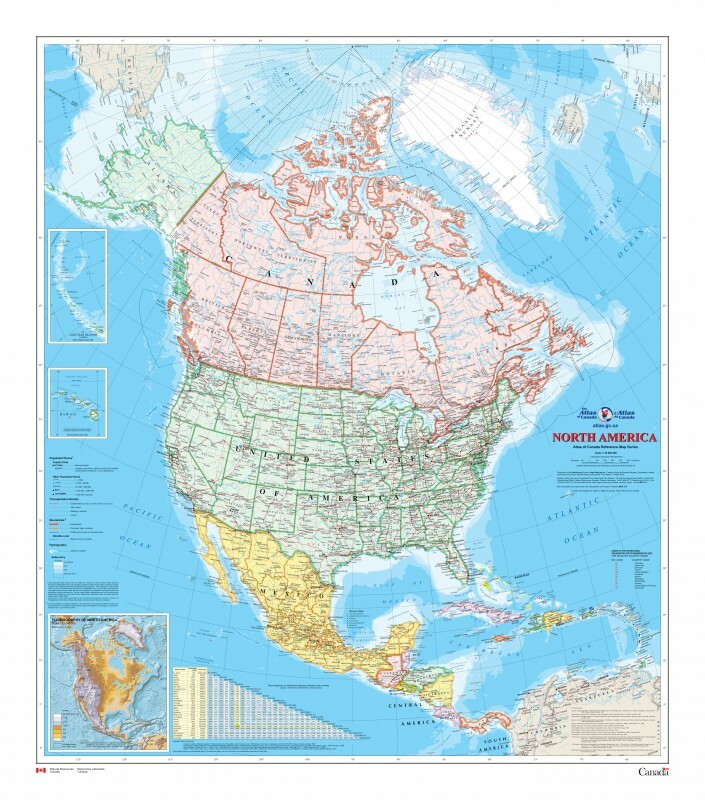 This map (MCR0001) is the latest publication in the Atlas of Canada Reference Map Series. 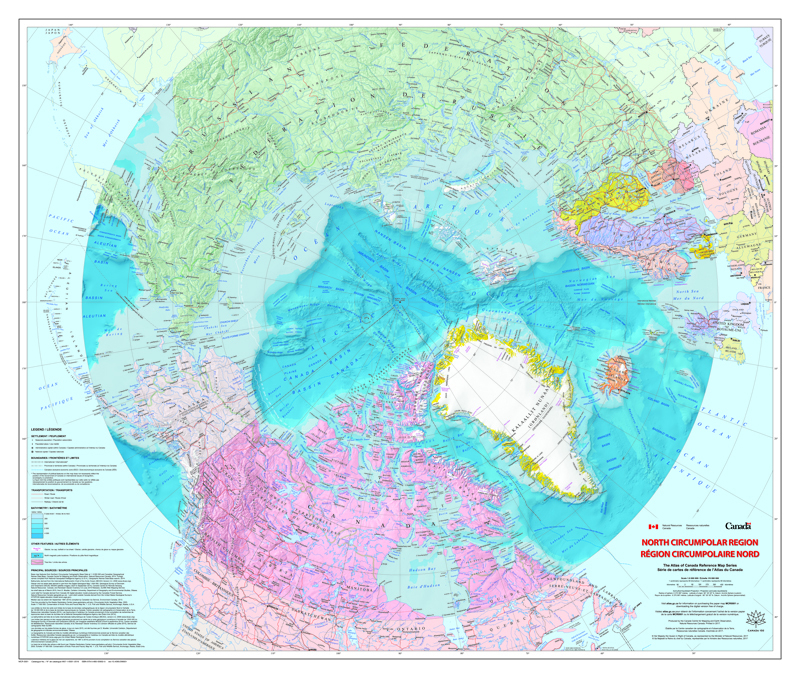 This bilingual map at a scale of 1:9 000 000 shows the geography of the northern circumpolar region, north of approximately 55 degrees latitude. The map uses the azimuthal equidistant projection. All international boundaries, as well as the Canadian provincial and territorial boundaries and Canada's 200 nautical mile offshore exclusive economic zone are displayed on the map. National capital cities, other cities, towns, villages and hamlets along with some seasonally populated places are also shown. The map identifies a number of significant northern features, including the median sea ice extent from September 1981 to 2010, the tree line, undersea relief, land relief, the Magnetic North Pole, glaciers, ice fields and coastal ice shelves. Many of the physiographic and hydrographic features are also labelled. This map shows North America at a scale of 1: 10 000 000. The map is a general reference map giving detailed coverage of populated places, transportation routes and the drainage network. Land areas are coloured to represent individual countries and dependencies. The map sheet has three inset maps showing the Aleutian Islands (Alaska), Hawaii and the North America relief with significant mountain elevations. There is also a table of road mileages between major cities. View more details on North America (2005) - Open Government.